Best View in Brooklyn: Need A Good Read? Enter This Contest! Need A Good Read? Enter This Contest! 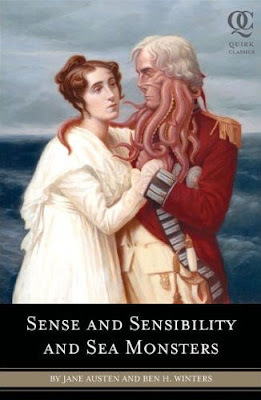 I can guarantee that at least 60% of Sense and Sensibility and Sea Monsters (2009, Quirk Classics) is lovely, well-written, and filled with social commentary. But then, I find Jane Austen's genius awe-inspiring. The other 40%, written by Brooklyn writer, Ben Winter, features Sea Monsters and Fang-Beasts. I haven't read it yet, but I think it will be bedside once I have a night table. Usually, I really hate when someone messes with stuff that doesn't need improving; the most recent egregious example is the Demi Moore as Hester Prynne film that ends happily for Pearl, Hester AND Dimmesdale. Argh! Or maybe it was the watered-down, simpering film version of The Handmaid's Tale. Anyway, the previous Jane Austen mash-up, Pride and Prejudice and Zombies, sold an insane 600,000 copies. According to a publishing insider, "Whoa." Hopefully, that bodes well for the SS&SM this holiday season. Send in your suggestion to bestviewinbrooklyn@yahoo.com for a place in Sunset Park that seems like it doesn't fit in with its surroundings, but actually works and adds to the community. It could be a new place of business, an establish gathering place, something that truly surprised you about Sunset Park when you first learned about it. Pretty much anything that is unusual or abnormal (in a good way) in Sunset Park. Priority will be given to "entries" that have a photo and a detailed explanation as to why it was chosen. Deadline is this coming Saturday - that's November 14th, 2009! Considering that the amount of commenters on this weblog is only about 2% of the unique visitors it gets, your chances are pretty good if you actually follow through with an entry. Free book! Whoooo! You can keep it to read or give it as a gift. It's brand new from the publisher!